One of the toughest parts of Marie Kondo-ing my kitchen was finding all the expiration dates and safety warnings on a multitude of bottles, cans, and jars in my kitchen. They don’t make it easy for you. I’d finally find a message that said, “See label for expiration date” while I was actually staring at the label. What? Where? But all of this sleuthing got me thinking: How much of a hard-and-fast rule is “refrigerate after opening” anyway? I automatically put things like ketchup, soy sauce, and Worcestershire sauce in the fridge, but why? Was I taking up valuable refrigerated shelf space with stuff that could better be housed in the pantry? Egg- and dairy-based products, like mayonnaise and ranch dressing, appeared to clearly own their spots on the prized fridge shelves. The rest seemed like a murkier matter. So, let’s tackle the items on my (and possibly your) cluttered fridge side shelf one by one, shall we? Keith Dresser of America’s Test Kitchen and executive food editor of Cook’s Illustrated notes that “People say that mayonnaise doesn’t need to be refrigerated because it’s pasteurized.” Those people might be throwing caution to the wind, however. Says Dresser: “My rule of thumb, anything with eggs in it has to be refrigerated, even though commercial mayonnaise may be pasteurized. Anything with eggs, proteins, any sort of vegetable, a good rule of thumb is to put those in the refrigerator.” Sounds like a good plan, and fortunately most of those condiments are easily identifiable. White creamy condiments like mayo and ranch? Into the fridge with you. According to a Heinz spokesperson, “Heinz recommends refrigerating its products after opening to maintain the best product quality,” and they note that this applies to all of its products, including mustard, BBQ sauce, and relish. This is not a surprising message coming from the reigning condiment leader, but a good thing to keep in mind nonetheless. This is where things get a bit fuzzier for me on a refrigeration level. Dresser agrees, “The things that get kind of tricky are the salty things or the super-acidic things.” Fortunately, from a food-safety standpoint, a Tabasco-like hot sauce is safe to have out because it’s so high in acid. So “there’s not going to be a lot of bacterial growth there, just because that’s a pretty inhospitable environment for that to live in.” Same goes for Sriracha, which you can safely leave out. Nevertheless, hot sauces like Tabasco, Crystal, and Cholula can oxidize over time. So in a few months, Dresser says, “if you’ve ever kept a bottle of Tabasco in your cabinet for a while, for a few months, it will start to turn color, start to go from a nice bright color to an ugly brownish red rusty color.” I definitely would not shake a Tabasco bottle whose color has turned, but just Marie Kondo it right into the trash. This brings up an interesting question in that “Refrigerate after opening” message: Is it a quality or a safety issue? or both? Dresser thinks that sometimes, it’s about quality: “I think in a lot of those cases, they’re saying refrigeration to protect the quality of the product, not necessarily from a food safety standpoint. 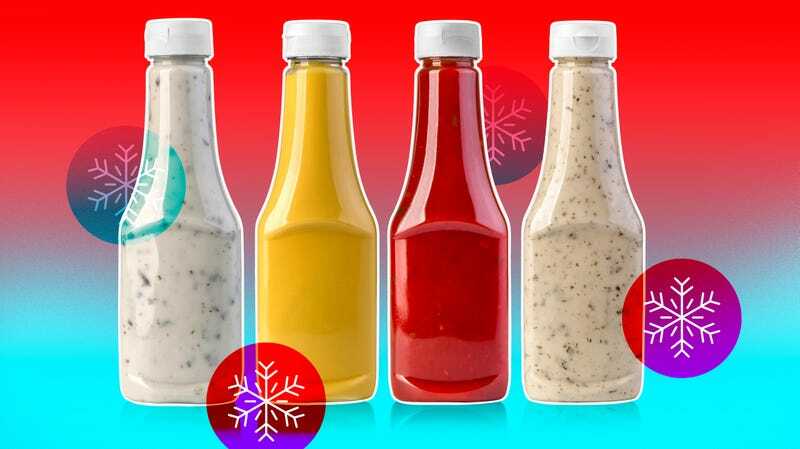 So if you don’t refrigerate it, you might be losing color and flavor from the stuff that’s oxidizing.” So if you’re going to use up the Tabasco in a month or two, you’re good; more like a year, and give it some of your sweet fridge space. The Worcestershire sauce breakdown is similar to Tabasco; Dresser says that “some brands of Worcestershire will say to refrigerate, some don’t.” But with Worcestershire’s salty, acidic environment, this is again more like a quality issue. I point out that Worcestershire does have a protein in it—anchovies, which makes it not vegan-friendly—but Dresser says, “because anchovies are so high in salt, that negates it.” That along with the fair amount of acid in the Worcestershire sauce makes it fairly self-stable, to at least stay on your pantry shelf on for a year or so. Cornell’s Cynthia James points out that soy sauce is “water activity controlled.” This means that “even though the product is a liquid, the available water in the product is tightly bound to other molecules”—in this case, salt—“so that there is not enough available water for any pathogens to use for growth.” So here’s another bottle I just pulled out of my fridge. Dresser says that I can add another bottle to that collection as well: “fish sauce, soy sauce, those can be kept at room temperature.” Soy sauce is another condiment that folks usually buy in fairly small bottles, to go through in a reasonable period of time, allowing for a continual level of quality even out of the fridge. Although our contact at Heinz would prefer you put the yellow stuff in the fridge, mustard also hosts those acidic and vinegar elements that enable a longer shelf life. As with so many of these, it’s a judgment call. Says Dresser, “If you’re going through a lot of Dijon mustard to make dressings or something, you can keep it in your pantry.” In this case, sunlight is the thing to watch out for, keeping the mustards in a cool, dark cabinet or pantry. But if you’re a rarer mustard user, only a few times a year, then keep it in the fridge. As the website of Ben’s Maple Syrup in New England points out, while the sugar in the syrup means that it doesn’t really need to be refrigerated, “refrigerating maple syrup will retard the growth of mold. If a container of unrefrigerated maple syrup is not checked often, enough mold may grow in the syrup, to ruin the flavor of the syrup.” Ben’s then advises just scraping the mold off the top of the syrup. Or, if that grosses you out, just leave the bottle in the fridge. That’s for pure maple syrup. What about the Aunt Jemima stuff? “That doesn’t count; that’s just corn syrup,” Dresser scoffs. Okay, Marie Kondo-ing that bottle as well. As pointed out above, vinegars can be pretty inhospitable environments for bacteria. So those are definitely cabinet-worthy, and other cool, dark places, far away from the light. Similarly, nut oils like almond and walnut should also be kept in a dark place, or else they’ll get rancid. Sure, some salad dressings have a lot of vinegar and mustards. They also often have shallots and garlic. So even bottles that are shelf-stable, but that also contain “any vegetable matter,” says Dresser, should go in the refrigerator once they’re opened. Personally, though, I am moving acid- and vinegar-heavy items such as soy sauce, Dijon, and Worcestershire to my pantry for the first time. We go through condiments like those pretty quickly over here. That probably says horrible things about our family sodium levels, but that’s an entirely different issue. Map of favorite condiments by state has us asking: what even is a condiment?